With more than 60 years of experience providing superior quality home renovations to residents throughout the Ottawa area, OakWood Renovation Experts have turned their expertise to a project closer to home. 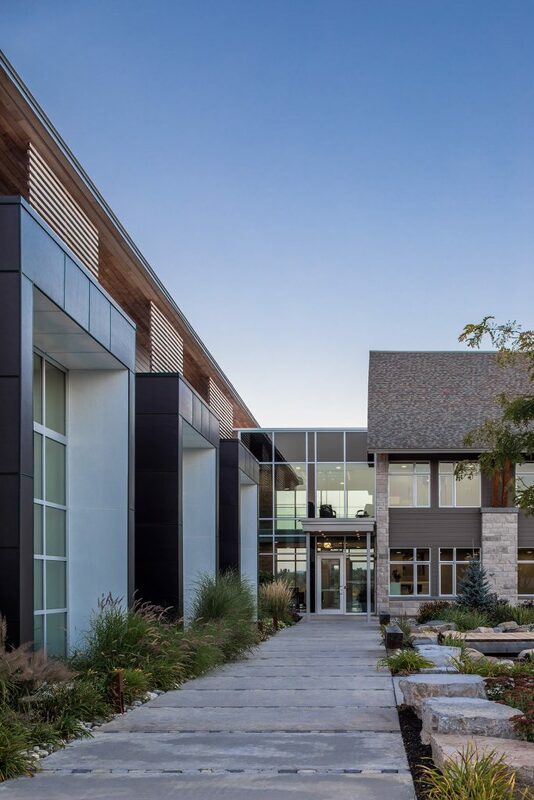 OakWood’s new corporate headquarters, located at Trim Road and Highway 174 in Orleans, was designed by Hobin Architecture, one of Canada’s most respected architectural firms. The building is an elegant combination of glass, steel, stone, and new and reclaimed lumber that is visually stunning – both inside and out. 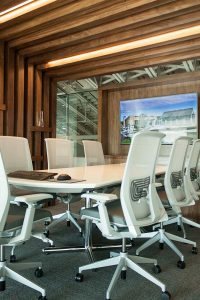 Careful consideration was given to the way the space was designed to unite the corporate and customer requirements of the space. “But we designed the space to be a bit of a showcase too – each bathroom is different, we included some reclaimed wood from the old building and incorporated it into the drop ceiling design in the main office areas,” explained Liptak. The new building is one of four Ottawa locations for OakWood, but is its flagship in more ways than one. Though it consolidates head office operations and human resources, it is also home to a state-of-the-art showroom, unlike anything Ottawa has ever seen. 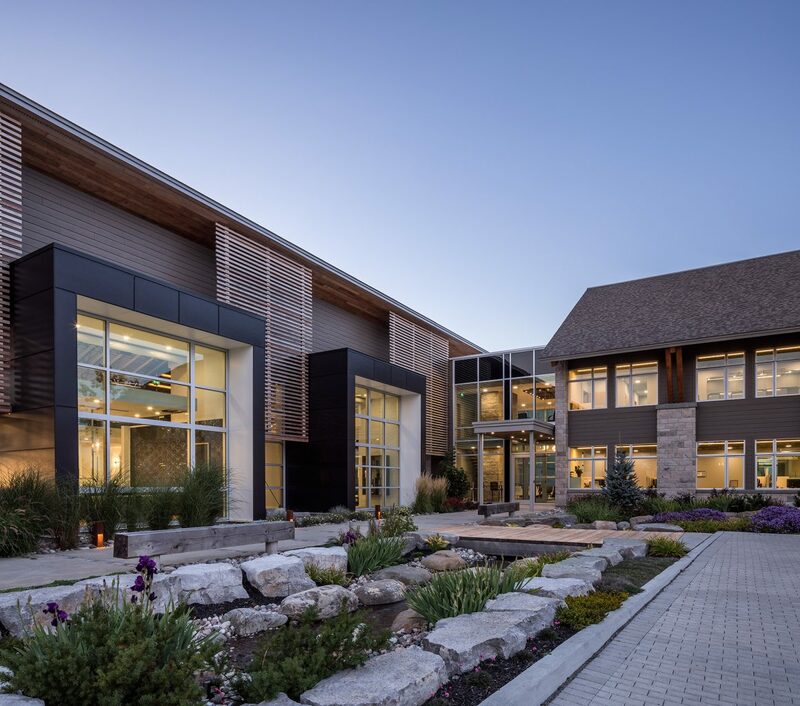 Both the corporate and showroom areas are warm and welcoming from the outside – with features like BC lumber to add unique visual charm while also providing some temper to daylighting, solid columns and generous windows, in addition to the exterior landscaping which features a breathtaking combination of stone, pond and bridge. The interior design provides a cohesive, collaborative and high quality environment for staff. Space is abundant and the building is equipped with all the latest technologies to ensure clean airflow, comfort, and an overall sense of well-being that translates into a productive, results-driven staff. Glass-walled conference rooms and modular furniture complete the scene. OakWood has been dedicated to pursuing standards of excellence for their clients for more than four generations. When the company decided to build a new head office, integrating sustainability, targeting LEED Platinum, providing a healthier environment for staff, and achieving a lower carbon footprint for the company as part of their commitment to excellence became integral parts of the project goals. 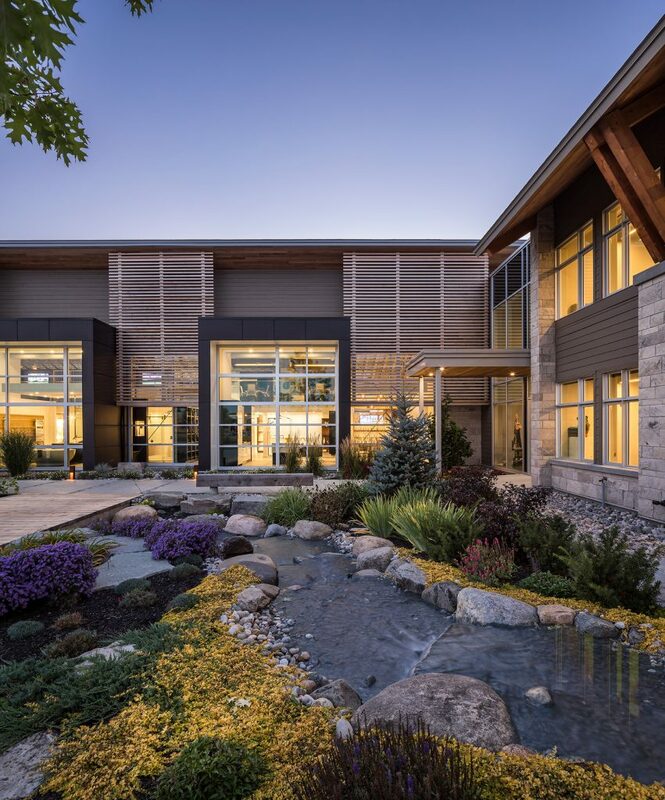 The Hobin team, including Patrick Bisson, Reinhard Vogel, Gord Lorimer and Barry Hobin, designed a space that would serve multiple objectives while incorporating sustainable green features and targeting that coveted LEED Platinum designation. The showroom encourages customers to interact with OakWood’s certified in-house planning and design experts in a carefully imagined environment. The showroom features a full range of concepts and materials, details and interactive planning and budgeting options that allow customers to see their vision in an applied setting. “We have a variety of scenes to let the client imagine what is possible. Two kitchens showcase the range of options for finishes, appliances, and technology. Both kitchens are fully functional and we plan to host kitchen and cooking demonstrations here,” shared Liptak. 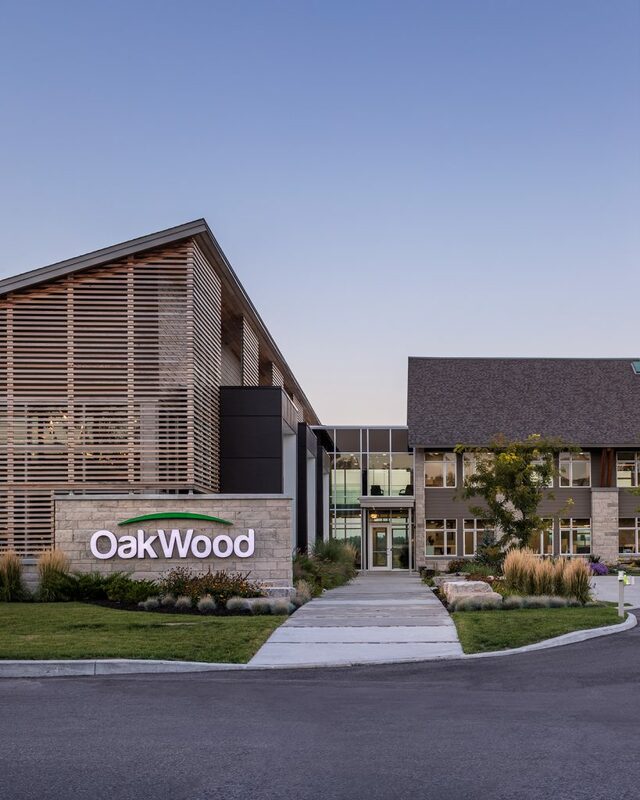 OakWood took advantage of the opportunity to create a technologically advanced building that exceeds the highest energy and environmental standards in Canada. The construction of the building was to take place on existing soil and care was given to ensure that construction would not change the composition of the property. Watershed was protected and any soil removed was relocated to another part of the property. All equipment was inspected before and after use to ensure that no fuel was leaking so as to not contaminate the property. To heat and cool the building, OakWood decided to use a geothermal system which draws water from twelve on-site wells. A weeping tile drainage system was installed around the entirety of the building so as to collect all of the building water runoff from rain and snow. The weeping tile ties into the building cistern where the collected water is fed to the facility’s toilets. All plumbing fixtures are low-flow and adhere to LEED standards. LG heating and cooling units are used in conjunction with the geothermal system. These transfer warm or cool air to the areas in need or from unit-to-unit without going back through the boilers. Solar panels mitigate hydro use. The entire building systems – heating, cooling, lighting, even security, can be controlled via state-of-the-art tablet applications allowing adjustments to be made in real time. All steel used in the building was mined and manufactured no more than 800 kilometers from the building. In fact, 90% of material used in the construction of the building was sourced locally and falls within the 800 kilometer range. All lumber is FSC-rated and comes from areas where trees are replanted for future use. All paints and adhesive have low or no VOC content. All electrical fixtures are LED. 35% fresh air is constantly being exchanged into the building. The air temperature is kept at a moderate 22.5 degrees. Now complete, the building is in the process of obtaining LEED Platinum certification with the Canada Green Building Council, and staff and clients alike are already enjoying the benefits of a well-conceived space.